Definition at line 32 of file CNormalFraction.h. Definition at line 47 of file CNormalFraction.cpp. Referenced by copy(), and createUnitFraction(). Definition at line 52 of file CNormalFraction.cpp. Definition at line 70 of file CNormalFraction.cpp. Cancel common items of mpNumerator and mpDenominator. Definition at line 211 of file CNormalFraction.cpp. References C_FLOAT64, CNormalSum::checkFactor(), checkForFractions(), CNormalSum::divide(), CNormalSum::getFractions(), CNormalSum::getProducts(), mpDenominator, mpNumerator, CNormalSum::multiply(), setDenominatorOne(), and setNumerator(). Referenced by createFraction(), and simplify(). Check if the denominator of this fraction equals 1. Definition at line 124 of file CNormalFraction.cpp. Referenced by convertToCEvaluationNode(), CNormalProduct::getDenominator(), is_mass_action(), normalize_variable_names(), CNormalGeneralPower::toString(), and toString(). Check if this fraction contains further fractions. Definition at line 184 of file CNormalFraction.cpp. References CNormalSum::getFractions(), mpDenominator, and mpNumerator. Definition at line 518 of file CNormalFraction.cpp. Referenced by CNormalGeneralPower::checkIsOne(), convertToCEvaluationNode(), and CNormalSum::simplify(). Definition at line 524 of file CNormalFraction.cpp. Check if the numerator of this fraction equals 1. Definition at line 115 of file CNormalFraction.cpp. Definition at line 434 of file CNormalFraction.cpp. Returns a fraction that is 1/1. It creates a new fraction and sets the numerator and the denominator to a unit sum. Definition at line 530 of file CNormalFraction.cpp. References CNormalFraction(), CNormalSum::createUnitSum(), mpDenominator, and mpNumerator. Referenced by CNormalGeneralPower::createUnitGeneralPower(), CNormalGeneralPower::multiply(), CNormalSum::simplify(), and test_simplify::test_simplify_1(). Expand this fraction by a lcm. Definition at line 196 of file CNormalFraction.cpp. References CNormalSum::getSize(), mpDenominator, mpNumerator, and CNormalSum::multiply(). Find lcm of denominators of respective fractions contained in this fraction. Definition at line 329 of file CNormalFraction.cpp. References CNormalLcm::add(), CNormalSum::getFractions(), mpDenominator, and mpNumerator. Retrieve the denominator of this fraction. Definition at line 157 of file CNormalFraction.cpp. Referenced by convertToCEvaluationNode(), CNormalGeneralPower::multiply(), normalize_variable_names(), CNormalSum::simplify(), test_simplify::test_simplify_1(), and CNormalGeneralPower::toString(). Definition at line 175 of file CNormalFraction.cpp. Retrieve the numerator of this fraction. Definition at line 148 of file CNormalFraction.cpp. Referenced by CNormalSum::add(), convertToCEvaluationNode(), is_mass_action(), CNormalGeneralPower::multiply(), normalize_variable_names(), test_simplify::test_simplify_1(), and CNormalGeneralPower::toString(). Definition at line 166 of file CNormalFraction.cpp. Multiply this fraction with a number. Definition at line 282 of file CNormalFraction.cpp. References CNormalSum::getSize(), mpNumerator, CNormalSum::multiply(), and setDenominatorOne(). Multiply a fraction with an itempower. Definition at line 296 of file CNormalFraction.cpp. References C_FLOAT64, CNormalSum::checkFactor(), CNormalSum::divide(), CNormalItemPower::getExp(), CNormalItemPower::getItem(), mpDenominator, mpNumerator, and CNormalSum::multiply(). Multiply this fraction by a lcm. CNormalSum*, pointer to result of multiplication ie. a normal sum. This fraction is useless now. Definition at line 357 of file CNormalFraction.cpp. References CNormalSum::getFractions(), mpDenominator, mpNumerator, CNormalSum::multiply(), and CNormalLcm::remove(). Definition at line 439 of file CNormalFraction.cpp. Definition at line 59 of file CNormalFraction.cpp. Definition at line 404 of file CNormalFraction.cpp. Set denominator of this fraction. Definition at line 96 of file CNormalFraction.cpp. Referenced by createFraction(), CNormalProduct::getDenominator(), setDenominatorOne(), CNormalProduct::setDenominatorsOne(), and CNormalSum::simplify(). Set the denominator of this fraction equal 1. Definition at line 133 of file CNormalFraction.cpp. Referenced by cancel(), and multiply(). Definition at line 81 of file CNormalFraction.cpp. Referenced by cancel(), createFraction(), CNormalProduct::getDenominator(), CNormalGeneralPower::multiply(), and CNormalSum::simplify(). Check if numerator and denominator contain fractions, find lcm of respective denominators, expand this fraction by lcm and cancel. Definition at line 379 of file CNormalFraction.cpp. References cancel(), expand(), findLcm(), CNormalSum::getFractions(), mpDenominator, mpNumerator, and CNormalSum::simplify(). 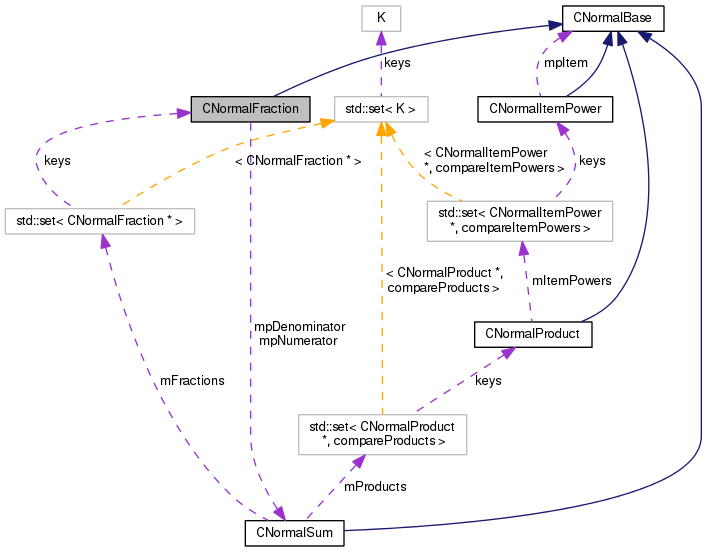 Referenced by CNormalTranslation::normAndSimplify(), CNormalLogicalItem::simplify(), CNormalGeneralPower::simplify(), CNormalChoice::simplify(), CNormalFunction::simplify(), CNormalSum::simplify(), and test_simplify::test_simplify_1(). Definition at line 418 of file CNormalFraction.cpp. References checkDenominatorOne(), mpDenominator, and mpNumerator. Referenced by CNormalTranslation::elementaryEliminationDivide(), CNormalTranslation::elementaryEliminationMinus(), CNormalTranslation::elementaryEliminationModulus(), CNormalTranslation::matchPowerBases(), CNormalTranslation::matchSummands(), CNormalTranslation::normAndSimplifyReptdly(), operator<<(), test_biomodels217_expression::test_term_num1(), and CNormalChoice::toString(). Definition at line 39 of file CNormalFraction.h. Referenced by cancel(), checkDenominatorOne(), checkForFractions(), checkIsOne(), createUnitFraction(), expand(), findLcm(), getDenominator(), multiply(), operator<(), operator=(), operator==(), setDenominator(), simplify(), toString(), and ~CNormalFraction(). Definition at line 38 of file CNormalFraction.h. Referenced by cancel(), checkForFractions(), checkIsOne(), checkIsZero(), checkNumeratorOne(), createUnitFraction(), expand(), findLcm(), getNumerator(), multiply(), operator<(), operator=(), operator==(), setNumerator(), simplify(), toString(), and ~CNormalFraction().